August has traditionally been a busy time at the White Pine County Fairgrounds and this year will be no exception. In addition to the County Fair, 4-H Livestock show and Auction, Bull Riding, and Barbecue, the White Pine Horse Race Committee will be conducting the 72nd horse racing competition in White Pine County. Originally organized in 1934, the races were formed by local ranchers and business people in an effort to overcome the depression blues. Some of the people involved in the formation of the races were Bill Goodman, Frank Calloway and Stan Draper. This group ran the races until 1937 when the county helped by forming a Fair Board. The first chairman of the board was Tom Bath, a local business owner. A year later, they would build a new race track and grandstand which is still in use. In 1950, the races were rained out, hurting the event financially. Subsequently, a group composed of various social clubs was formed under the “Pony Express Committee.” This group ran the event until 1954 when the local Elks Lodge took over. The Elks had been heavily involved in the races and had a large membership. 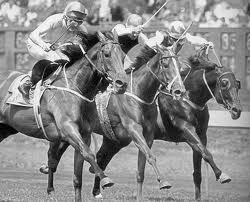 The lodge would run the races for the next 40 years until 1993 when they could no longer operate profitably. However, during that time, the lodge contributed nearly $250,000 from the race proceeds to make improvements at the fairgrounds. Some of the improvements included new restrooms, a pari-mutuel building, paddock and jockey room and several new horse barns. Shortly, another group of volunteers in cooperation with the local Agriculture District 13 picked up the challenge and managed to run race meets until 2000 when it was decided it was no longer practical or profitable to operate the event and they were discontinued. During its history, the races were run in conjunction with other events including the White Pine County Fair, the 4-H livestock show and auction and a barbecue/dance by the local Cattlewomen’s Association. On these weekends, the fairgrounds were a favorite social event packing the fairgrounds with people. The loss of the races had a significant impact on these events and the community at large. In 2006, the Ely Elks Lodge No. 1469 again felt the need to revive the sport in Ely. At that time, there was only one live race meet operating Elko and there were Mule races in Winnemucca. Recent legislation which made funds available for purses promised to make the effort more practical and the White Pine Horse Races were officially organized once again. Support from the local community and surrounding areas was even greater than anticipated and the 2006 meet was a success, gathering the largest crowd ever at the fairgrounds, according to one spokesman. “We ran out of beer and food items and had to get more in a hurry,” he added. Buoyed by that success, the Ely Elks continued to conduct the races in cooperation with Agricultural District 13 until 2010. When it became too difficult to man the event. Unwilling to let the races die, several community volunteers, headed by Robert Bartlett, organized the White Pine Horse Race Committee in 2010 and, with seed money left over from the Elks Lodge, the races were able to continue, again in cooperation with the local Agricultural District 13. This year’s pari-mutuel manager is Jim Bath. Jim is the son of Tom Bath, the first ever chairman of the Fair Board back in 1937. Tom was instrumental in making the fair grounds an attractive place to run the races, and now his son has a hand in the history of the White Pine Horse Races as well. Although smaller than the Elko race event, the Ely race attracts as many as 150 to 250 thoroughbreds and quarter horses along with their owners, trainers, jockeys and other racing enthusiasts. The participants mainly come from Utah, Idaho, California, Arizona and as far away as Oklahoma. This not only provides a fun weekend, but contributes significantly to the local economy. Proceeds from the races have helped make even more improvements to the fairgrounds, such as a better sound system, announcing booth, testing barn, horse walkers, to name a few. The Agricultural District has also made major improvements, such as modern metal stalls for the horses.